The new iPad starts at $329 and will be available starting March 24. It features a 9.7-inch screen, a 64-bit A9 processor, and iOS 10. Also, a (PRODUCT) RED model for the iPhone 7 and iPhone 7 Plus is now available. Apple has unveiled a new iPad today, and it comes with a feature not usually found on its products: an attractive price tag. The iPad starts at just $329; as a result, it makes a few slight compromises compared to its Pro sibling. 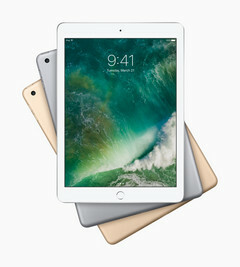 One example is the processor—the iPad uses a 2015 Apple A9 processor instead of the iPad Pro's more powerful A9X processor (also from 2015). The iPad's 8-megapixel rear camera is a step down from the iPad Pro's 12-megapixel camera. Finally, up to 128 GB of storage capacity is available on the iPad, compared to 256 GB on the iPad Pro. Some of the iPad's other specs include a 9.7-inch Retina display, with a 2048x1536 resolution at 264 PPI. Wi-Fi only and Wi-Fi + Cellular models are available, in silver, gold, and space grey colors. The $329 price gets buyers the 32 GB base model; the 128 GB version costs $100 more. A 1.2-megapixel front-facing camera is included; the rear camera supports 1080p recording at 30 FPS or slow motion recording at 120 FPS. The iPad features iOS 10, and runs the same apps and services as other iPad and iPhone products. Although the iPad was unveiled today, it will not be available for purchase until March 24. And for those wondering, this new iPad effectively replaces the iPad Air 2, dropping the "Air" moniker and returning to a simpler naming scheme. Besides unveiling the iPad, Apple also launched red iPhone 7 and iPhone 7 Plus models under the (PRODUCT) RED brand. As always, 50 percent of the profits earned from each (PRODUCT) RED iPhone will be donated to the Global Fund's fight against HIV and AIDS. The (PRODUCT) RED iPhone 7 is available to purchase immediately. Educational apps like Swift Playgrounds make the new 9.7-inch iPad the ultimate tool for students. iPad features a beautifully bright Retina display with over 3.1 million pixels for stunning pictures and videos, and is enclosed in a sturdy yet thin aluminum unibody enclosure weighing just one pound for great portability and durability. The Apple-designed A9 chip with 64‑bit desktop-class architecture delivers fast processing and graphics performance for apps and games, while maintaining the same all-day battery life customers have come to expect from iPad. iPad is available to order beginning Friday, March 24, from apple.com and starts delivering to customers and arriving next week in Apple Stores, through select carriers and Apple Authorized Resellers (prices may vary) in the US and more than 20 countries and regions, including Australia, Canada, China, France, Germany, Hong Kong, Italy, Japan, Mexico, Netherlands, Spain, Sweden, Switzerland and the UK. Denmark, India, Mexico, Norway, Russia, Turkey and other countries and regions will follow in April. Brazil, Taiwan and other countries and regions will follow in May. Every customer who buys iPad from Apple will be offered free Personal Setup, in-store or online, to help them customize their iPad by setting up email, showing them new apps from the App Store and more. Anyone who wants to learn the basics or go further with their new iPad can register for a free workshop at any Apple Store.